It is no secret that denture adhesives on the market today just don’t perform. Stabil-Dent® is a new and different way to stabilize a loose lower denture. 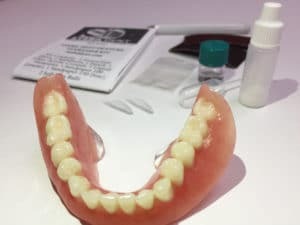 It can be a great alternative to denture adhesives or it can be used in conjunction with your adhesive to make your favorite denture adhesive perform better. Our patented design will not harm your denture, can be easily removed if necessary and will last the lifetime of your lower denture. Who would have thought the pressures from the tongue that moved your loose lower denture around can become your best-friend, when properly utilized? Stabil-Dent invites you to take a modern approach to a lower denture. Instead of trying to hold an ill fitting lower denture with daily, poorly performing denture cream we suggest a clinical reline (see how to get a proper reline here) to get a proper fitting lower and then the application of Stabil-Dent. Stabil-Dent solves the age old problem of an unstabilized lower denture with the application of two acrylic wings to the tongue side of your lower denture. The tongue muscles then naturally put pressure on the top of the stabilizers, stabilizing your lower denture. Read the Stabil-Dent guarantee. Like Cushion Grip, Stabil-Dent does not weaken with time or hot liquids. Stabil-Dent requires no maintenance and free’s you from the daily routine of denture adhesives. 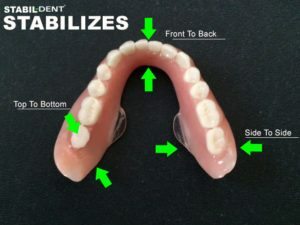 Our goal is satisfied customers, please note; Stabil-Dent stabilizes the rear of your lower denture from moving up and down, front to back and left to right. Stabil-Dent will not correct a poorly made lower denture or one that has not been appropriately relined. Find out the facts behind getting a proper reline by clicking here. What People are Saying about Stabil-Dent! I’ve had dentures for 40 years and know the problems that one faces with a lower denture. A friend of mine heard of this new breakthrough and had her lower denture done, so I called and made an appointment. I’m so pleased with the outcome, no denture adhesives and I can eat anything without the denture flipping up. When I first got my lower plate, I had lots of trouble keeping it in place. Every time I opened my mouth or tried to eat it would come up and about fall out of my mouth. Glacier Denture Center put stabilizers on my lower plate and I am now able to eat normally and open my mouth without the fear of losing my teeth. I had always heard that having a lower denture was uncomfortable and hard to keep in place. However, with the stabilizer, my denture stays in place and makes it much more comfortable and easier to eat. Thank You! I ordered the kit and I had my granddaughter put them on because my hands are not very steady. I can’t believe how my lower denture stays in place now. I always had to put stickem in and now I don’t have to. It does what they say. I would recommend this product. I had two implants and they worked very well but food kept getting under my lower denture. I told Dr. Kandarian about my problem and he suggested Stabil-Dent stabilizers. After getting them put on my lower denture, I couldn’t believe the difference they made. If you are in need of help for your loose lower denture I strongly recommend Stabil-Dent.